Available Until 30th April 2019. Don't Miss Out! 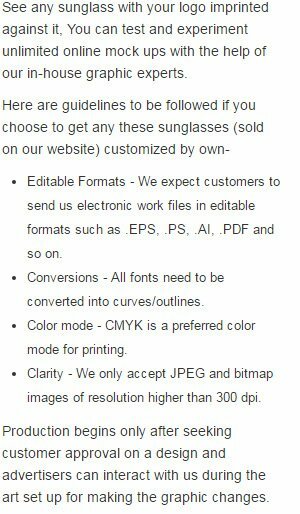 Custom sunglasses - Oahu Sungasses are a thoughtful gifting choice for marketers who wish to catapult their brand quotient and at the same time keep a wearer enchanted for a long time. This sunglass stands very less chance of rejection because most of the wearers find it cool, chic, and trendy. A logo imprinted promotional Oahu sunglass can be handed out as an appreciation token, acknowledgement gift or a brand building token – during some business events and sales driving events. Advertisers can hit upon these glasses offered in rainbow of colors - depending on their promotional requirements and personal preferences. A custom sunglass makes a great giveaway during 80’s themed parties, summer festivals, family events, etc. UV400 protection. One size works for most adults. Imprint Area: 2" X 5/16".